I intended to get this recap done sooner, but … life. The week after the race was Homecoming week, and since I’m the Student Council adviser, it’s one of my busiest weeks of the year. And because I’m really smart, I assigned essays in two different courses that week. So I had to grade essays for two different courses between Homecoming events. Blogging went on the back burner, but now that’s over and I want to get this written before I forget all the details. 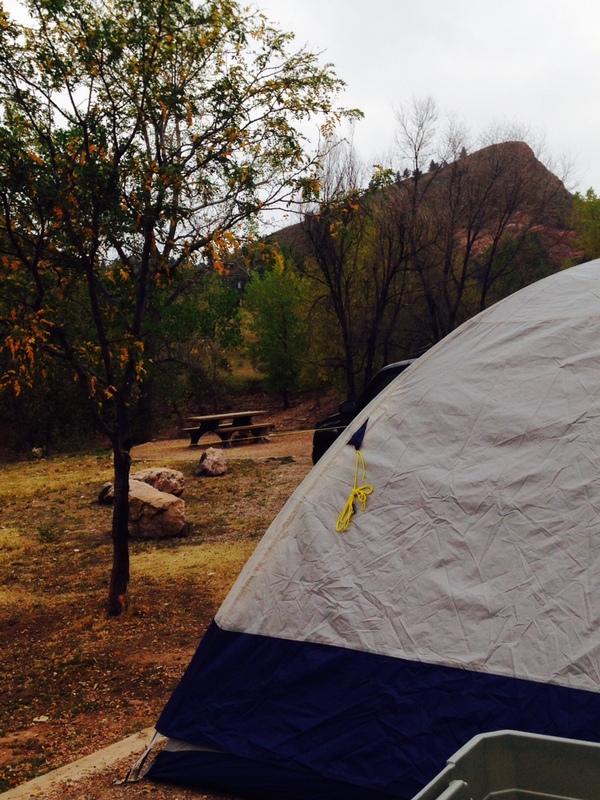 When I registered for the race, J and I decided that we’d camp at the trailhead instead of getting a hotel in Fort Collins, because $15 camp site > $100 hotel room. As we watched the forecast during race week, we grew a little nervous, as rain was predicted for Saturday, but we decided to stick with the original plan. We headed up to the Fort on Saturday afternoon, set up our tent, and wandered around the campground for a while before cooking a simple pre-race dinner of chicken and potatoes with a Clif bar for dessert. The weather held off until we finished dinner, but shortly thereafter, thunder and lightning started, and soon the clouds opened up. 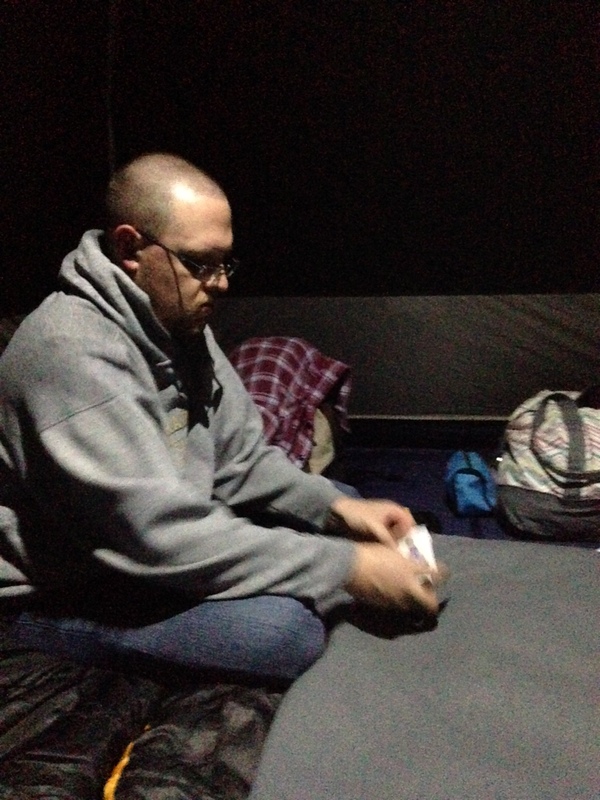 J and I retreated to our tent and spent the rest of the evening playing Go Fish, because we are adults. After a few rousing rounds of Go Fish, we called it a night and burrowed down into our sleeping bags. Neither of us slept great, thanks to the wind wiggling the tent and my typical nervous pre-race sleeplessness, so I was awake before my alarm went off at 5:30. The rain had stopped, but the morning was foggy and chilly. I’d been indecisive all week about wearing my compression socks during the race, but when I discovered how cold the morning was, I decided to wear them, and I’m glad I did. While Jordan started some coffee, I ate a Clif bar and a banana, then headed up the trail to pick up my packet. I ended up in line behind the eventual women’s winner, whom the RD encouraged to try for a course record (spoiler alert: she got it). Packet pick-up was easy, and “swag bags” were simple — the race t-shirt, plus a toothbrush and toothpaste. I pinned my bib on and headed back to the campsite to drop my bag off and get a cup of coffee, then came back to stand in the porta-john line (because coffee). I’m not a Skirt Sports ambassador, but maybe I should be — my skirt, top, and arm-warmers are all theirs. As start time approached, the RD told everyone to line up at the start line, but he waited to start the race until the porta-johns were empty, which meant a 10-minute or so delay. Though I wasn’t still in the bathroom line, I appreciated this move — I’ve started more than one race late because I’m in the bathroom when the gun goes off. I thought waiting for everyone was a cool thing to do. Once the johns were empty, the RD gave us a few simple directions, and we were off into the foggy morning! The first couple of miles were a little crowded, but at least that kept me from going out too fast, and soon, the crowd spread out — especially when we hit the first big climb. I did a lot of hiking (as did everyone around me): jogging when I could (or when there was a camera) and slowing to a hike when I needed to. Photo by O Photography, taken from Gnar Runners’ Facebook page. I definitely was running only because I saw the camera. The guy in red and I both started walking as soon as we passed the photographer. Just like the time I ran it in training, the hill seemed to go on for eternity, but eventually, we reached the turn-off and got in some glorious downhill. I actually got passed more on the downhill than the up; especially since it was so wet, I wasn’t too confident in my footing and didn’t want to take a race-ending tumble this early in the race. Before I knew it, we hit the first aid station and headed back down toward the start and (eventual) finish. I made up some time on the long, smooth descent, and soon was cruising back past Jordan and our campsite. Originally, I planned to toss him my arm-warmers as I ran back through, but I was still chilly and wanted them on. In fact, I ended up wearing them for the whole race! Coming down into Towers aid station. Photo by O Photography Studio, pilfered from Gnar Runners’ Facebook page. I passed back through the aid station/start line at mile 9 and headed out the other direction on the Blue Sky Trail. I hit a really low mental spot shortly thereafter, around mile 10 — probably the lowest I’ve ever been in a race, actually. That first big climb and descent left my legs pretty tired, and some foot pain I’d been dealing with for two weeks flared up pretty badly. I walked hills that weren’t even hills. I cursed myself for training for only 12 weeks, for thinking I could run a trail race when I live so far from trails. 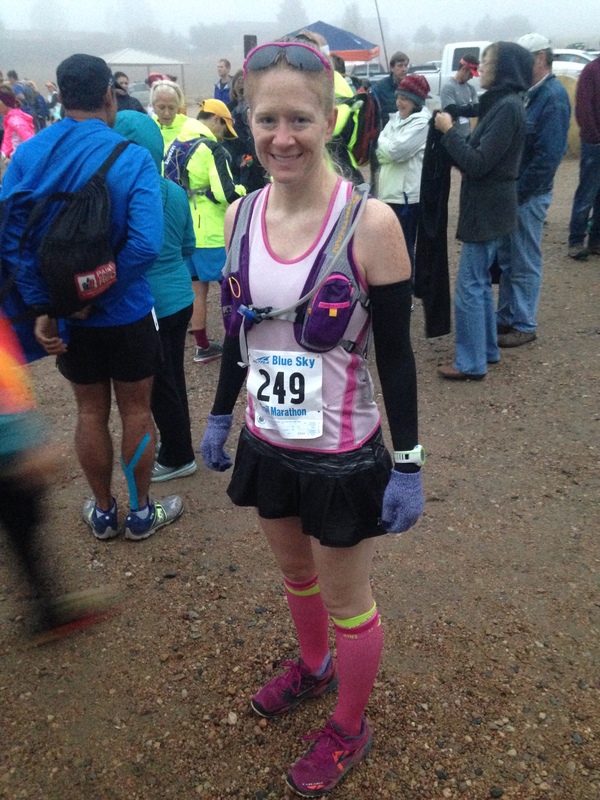 I wondered if I could even finish, or if I should just turn back, take a DNF, and go home. But then, I thought about how a month before, I watched Logan run 100 miles — almost four times as much as I was running — on relatively limited training. Using her as inspiration (thanks, Logan! ), I told myself to stop being an infant. I reminded myself that this was my choice, that I get to run trails. Eventually, I talked myself out of the grumpies and started enjoying myself again — and my foot stopped hurting. Although it bothered me before the race, and has a little since, I seriously think that at that point, it was all psychological. Once I got out of my funk, I realized that I was now on the part of the trail that I’d trained on several times this summer, and that helped my confidence, too. Soon I passed another aid station and headed up to the Indian Summer loop… the loop that had messed with my head every time I ran it this summer. It’s not super steep — definitely runnable — but the trail winds around, and it makes you think the climb is almost finished… then you round another bend and up you go. Of course, what goes up comes down, so you also get a nice, long descent. On Indian Summer, I chatted with a nice older guy, also running his first trail race, and conversation made the time go faster. Seeing the leading men, already heading back the other direction, was less encouraging, but quite impressive. Those dudes are speedy. After Indian Summer, I headed on out toward Devil’s Backbone and the technical, rocky trails there. I was thankful that I’d trained out there and gotten more comfortable with those rocks; they were tough as it was. 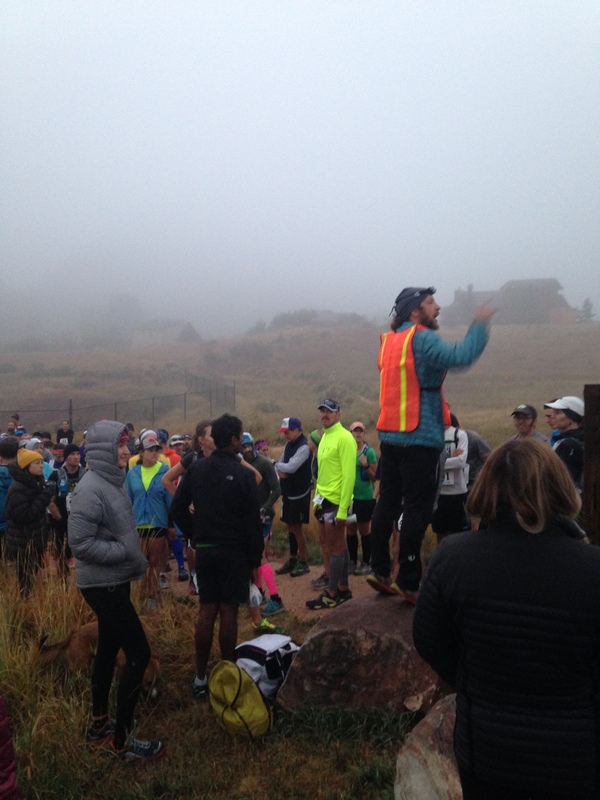 The course loops all around on the rocks, and before I knew it, I was headed back toward the finish, counting down the miles as I headed back around Indian Summer, past the final aid station, and up the final “big” climb. My legs were tired and hurting, but I felt pretty good, overall. Even though I was tired, I thoroughly enjoyed this part of the race. At this point, I knew I’d make it, and unless the wheels fell completely off, I’d meet my goal of going sub-five. The last mile, however, was a struggle. The course is 26.7 miles, not 26.2 (which I knew going in; it’s on the website), and that last half mile seemed like a cruel joke. I’m a little embarrassed to admit this, but I stopped to walk while I could see the finish line. Seriously. I had nothing left. Then a guy came up behind me and said, “Don’t walk now! Come on, come on!” That gave me the jolt I needed, and I ran with him to the finish, crossing the line in 4:50:41 and finishing in 10th place among women. Just dying a little bit. Photo by O Photography Studio, taken from Gnar Runners’ Facebook page. Jordan and our friend Shane, who lives in Fort Collins and came up to watch, cheered as I crossed the line, then hobbled with me (okay, I was the only one hobbling) to the food and drinks. Nothing appealed to me except ginger ale, which is weird because I don’t even like ginger ale, but my stomach was a little upset, and that stuff tasted heavenly. I chugged three cups of it. I knew I should eat something, too, but solid food sounded horrid. Instead, I took a shower at the campground while J and Shane took down our camp. Once I finally felt like eating, we headed back to the post-race bar-be-que, watched the awards, and stayed for the raffle (I won some Smartwool armwarmers)! I kinda loved the message on this Sierra Trading Post sign at their finish line booth. I think I’m hooked on trail races now, and I definitely want to do this one again. Aside from my mental breakdown at mile 10, I loved everything about this race. The course is pretty, and it was ridiculously well-marked. It’s also probably more runnable than I made it, which is part of why I’d like to run it again, with a little more training under my belt. The other runners were super friendly and supportive, even the wicked-fast dudes in front. The RD was well-organized, and everything from the start to the aid stations to the bar-be-que and awards ran smoothly. The aid station volunteers were fantastic, standing out there in the cold, misty morning, screaming and cheering for every runner as though each was winning the thing (one of my favorite parts of the whole race was coming through the last aid station and telling the volunteers “You’re the best!” and hearing the reply, “No, YOU’RE the best!”). 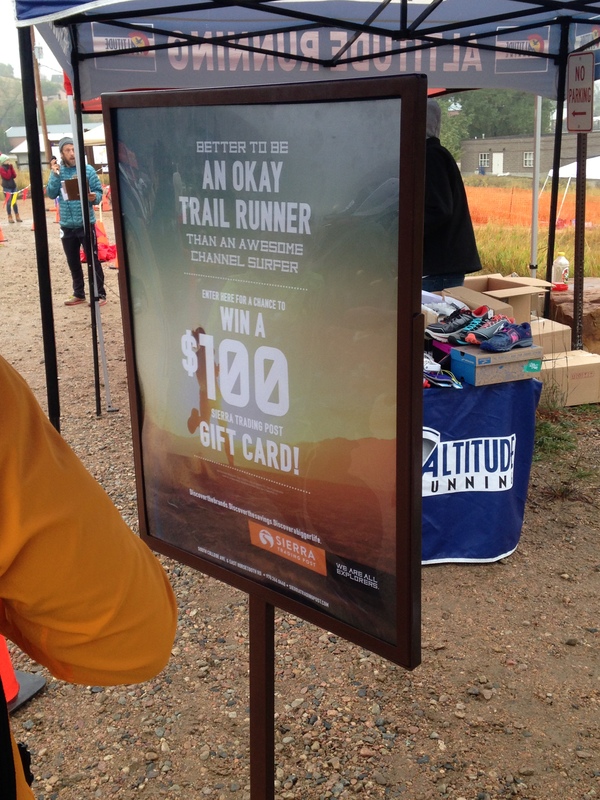 And the raffle at the end was incredible — they gave away sweet prizes ranging from socks to Ultimate Direction hydration packs and Altra shoes. This race was everything I hoped it would be. I proved to myself that I can run trail races, even living out here. I pushed myself to keep moving for more than an hour longer than I’d ever run before, and I finished something I wasn’t sure that I could. I’m proud of myself… and I can’t wait to get out there again.